There are many possible ways to broadcast both the time and your level of nerdiness to the outside world. A Star Wars projection clock, for example. A watch that tells the time in binary also works. But far, far more effective than any of these is a bedside clock that uses the Fibonacci sequence. As you may remember from that Dan Brown novel, the Fibonacci sequence is an integer sequence formed by adding the last two numbers together to form the next one: 0, 1, 1, 2, 3, 5, 8 and so on. It’s the math behind the golden spiral, a logarithmic spiral that occurs a creepily large number of times in nature. In the hands of Philippe Crétien, however, the Fibonacci sequence can also tell the time in a brilliantly simple way. His clock has five squares, representing the first five terms (ignoring 0) of the sequence: 1, 1, 2, 3 and 5. 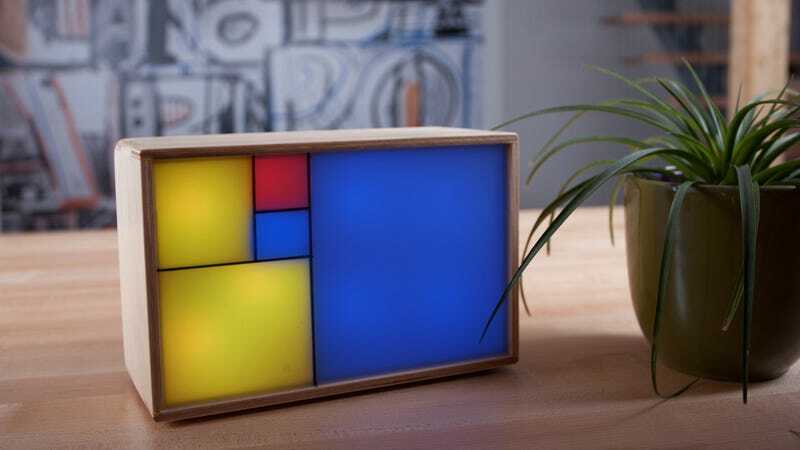 The squares light up different colors depending on the time: add the red and blue squares to get the hour, and add the red and green squares (multiplying by five) to get the time, to the nearest five minutes.